Low-Stress Cycling (LSC) refers to the idea that a network may be established to ensure that there are ways in which cyclist can easily access areas throughout a city, without being an extremely confident rider. A recent study indicates that while a small fraction of the population will tolerate sharing a road with heavy or fast traffic, most individuals are “interested but concerned.” The average bicyclist is willing to accept only a small degree of traffic stress. The Delaware Department of Transportation (DelDOT) has consulted with renowned Civil Engineering Professor Peter Furth (Northeastern University) to help implement a tool called “Level of Traffic Stress (LTS) Analysis” to help plan effective, safe, and well connected bikeway networks in Delaware. DelDOT has conducted LTS analysis on roadways, streets, and pathways throughout the state. A series of maps have been produced by DelDOT, and will be available online, to help communities visualize the disconnectedness of segments within Delaware’s bicycling network and plan for future infrastructure improvements. What is the Low-Stress Bicycling Assessment Tool? 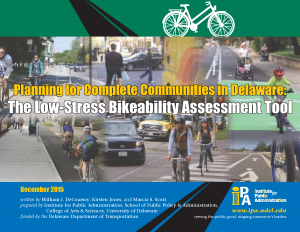 Planning for Complete Communities in Delaware: The Low-Stress Bikeability Assessment Tool is a resource for Delaware local governments that are considering ways to improve the low-stress bikeability for areas within their community. It is designed to guide local governments in evaluating the extent to which average bicycle riders can easily access low-stress areas, and in developing strategies to leverage state investments to improve local cycling networks and bicycle infrastructure. The Low-Stress Bicycling Assessment Tool should be used in combination with DelDOT’s maps to help communities target high-priority locations to plan for infrastructure improvements, bridge network connectivity gaps, and enhance low-stress conditions for the average bicyclist. 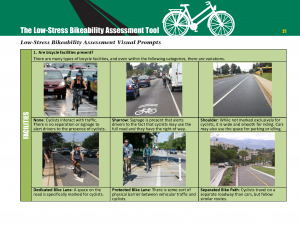 What is the Process for Using the Low-Stress Bikeability Assessment Tool? Step 1: The Pre-Assessment – provides a preparation process to ensure the success of the low-stress bikeability assessment. It provides outreach to and engages community members and recommends reviewing plans and planning resources, gathering data, and selecting a study area. The downloadable Low-Stress Bikeability Visual Prompts should be provided electronically to participants in advance of the workshop to familiarize them with what to look for during the in-field bikeability assessment. 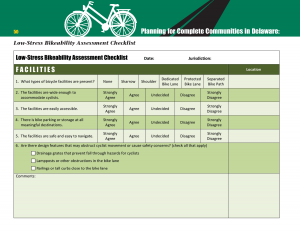 A Low-Stress Bikeability Assessment Checklist is also available that can be downloaded, printed, copied in a double-sided format, and distributed to workshop participants. The Checklist should be used by participants during the in-field bikeability assessment to record observations and bikeability conditions. Upon completing the in-field assessment, participants immediately reconvene in a facilitated workshop setting for a debriefing and interactive mapping exercise. Step 3: Post-Assessment – entails carrying out a process that involves prioritizing concerns, preparing a written summary, presenting findings to key stakeholders and funding entities; gaining support; and developing an action plan that considers the need for plans, policies, design changes, funding support, maintenance plans/agreements, and technical assistance.